One last base in this very complete trip across some of the main cities and states in the USA; this is the time for one of the most historic city in the entire country: Boston. Leaving behind massive Chicago for this very cute, elegant and although quite large; still feeling small and compact enough to call it cosy and charming if you like. Welcome to the capital of the state of Massachusetts and by difference, the main city in importance in the whole region of New England. “The Freedom City” as it is known by one of its many nicknames, here is where the Freedom was proclaimed. This is now my 4th or 5th time in this beautiful city, although the first time was quite complete as well since I came to be with an American family for 5 weeks, living nearby in the smaller city of Hudson, MA; hence why I spent more than one time coming downtown. Still, that was very long ago in the year 2000 and I was too young. It took another 12 years for me to return, and now, 6 more years to finally be back here. This time with more experience in travelling than ever before, and more time to enjoy as much as possible every corner there left to discover and re-discover. One of the most culturally influential cities in the country, home to some of the most exclusive universities in the world. A magnet of knowledge from all over the world and very important ever since its foundation back in 1630 by settlers from England. Some of Boston’s firsts include the first public park in 1634, the Boston Common; the United States’ first public school in 1635, the Boston Latin School. In 1852 the Boston Public Library was founded as the first free library in the United States, while the first subway system was opened in 1897, only third in the world after London and Budapest. Due to its importance since the foundation, and its prime location near the ocean, it became the largest city in the country until Philadelphia surpassed it in the 18th century, and thereafter New York City. Losing importance, it suffered like no other from the 18th century Revolution and sieges from where it took its nickname the Freedom City; the 1812 War, and of course, like many major cities in the country a Great Fire; that was in 1872. From the ashes and rubble, the city expanded towards the sea, gaining more land and increasing its population. Elegant boulevards were created and filled with grand mansions and buildings, private and public. Gardens, squares, monuments. The general trend back in the times. However the crashed of the heavy industry made a step decline in wealth, population and increase of crime that lasted for over 30 years until its regeneration starting from the 1970’s onwards. Today, Boston is one of the most gentrified cities in the country, one of the most liveable but also one of the most expensive. Visiting the city is easy, and three days is well more than enough to complete every sight at a quiet and enjoyable pace. Furthermore for easiness in sightseeing everything relating to the Freedom Trail (the main architectural sights and landmarks), the entire route is marked in the floor as a line of red bricks and detailed explanation given for each of the place in an informative billboard including old imagery. Another great sight is to take the boat from the dock next to Quincy Market to the USS Constitution. The views of the skyline are the best you can get; and while you are around Quincy you have the chance to get as many food as you wish from all kind and around the world. The Quincy Market building is just full of food stalls! Speaking about food, it is heavily influenced to that you have in England; and due to its location by the coast it includes seafood and fish as one of its bases. A must try is the clam chowder soup. This is served in a bowl made of bread while the soup itself is sticky, with potatoes and of course, the main ingredient, clam. A very recommended place would be the Union Oyster House near the Quincy Market in Union Street. Not only this is a beautiful setting in a historic building along the Freedom Trail, the oldest restaurant in the country! it does serve great food, among their specialties, seafood and fish. Another highly ranked place is the Chart House, in Long Wharf near the Aquarium, just east from the Quincy Market. This is a prime choice for seafood in the city, with very competitive prices for lunch to be honest. For more information about Boston check Wikipedia and Wikitravel sites. The United States of America currency is the Dollar (USD, $). Please note that any price reference is true as from when this guide was created, therefore check prices in advance as with the time they change. Back Bay West of the Downtown core. One of the most elegant districts in the whole of Boston, with wide avenues and streets in orthogonal grid; the result of the rebuilding and expansion of the city after the 1872 Great Fire filled with Victorian brownstone homes and considered one of the best preserved examples of 19th century urban design in the United States. -Prudential Tower The 2nd tallest tower in the city, located by the same name of the subway station, Prudential. Built in 1964 in International style. The observatory deck is opened to the public, but the view is obstructed in part by the Hancock Tower. 20$ for adults, 16$ senior and students. -Copley Square One of the main squares in the city fully surrounded with great buildings. It’s two blocks ahead from the Prudential along Boylston Street. -John Hancock Tower Designed by I.M.Pei in 1972. At 60 floors, it is still the tallest building in New England. -Public Library Completed in 1892 is one of the greatest examples of Beaux-arts architecture in the country. Free to enter inside, really impressive and beautiful. -Old South Church Built in 1875 in Venetian Gothic style. -The Fairmont Hotel One of the most luxurious in the city. Opened in 1912 in the place of the former Museum of Fine Arts. -Trinity Church Completed in 1877, and arguably regarded as one of the finest buildings in the country. You can get great pictures of its reflection in the glasses of the Hancock Tower. Beacon Hill One of the most exclusive areas in Boston, and also the most desirable and expensive to live. The buildings are mostly Victorian brownstones and Federal style. 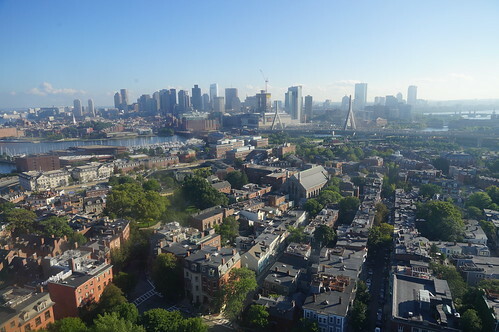 It is located sandwiched between Back Bay that lies at the west and the Downtown that limits to the east. -Boston Common The main urban park in the city, and the oldest in the country dating from 1634, only 4 years after the city’s foundation. Beautifully landscaped, it is not only just great inside, but the streets it limits on the perimeter are full of impressive Federal Victoria houses (such as Beacon Street). -Acorn Street North from the Boston Common, off nearby beautiful Chestnut Street, it is one of the many charming little alleys in this area containing great examples of Federal style rowhouses. Dowtown – The Freedom Trail The main sight of Boston is this 2.5 mile walk passing 16 historical sites. Here in the official website you can find all the information and print a map of it. -1 State House Completed in 1798 still stands as one of the most magnificent buildings in the country. -2 Park Street Church Founded in 1809, was back then one of the first landmarks visitors would see of Boston. -3 Granary Burying Ground Established in 1660, takes its name from the granary that once stood nearby. Some of America’s most notable citizens rest here. -4 King’s Chapel Completed in 1754, the third structure since the previous ones became too small. -5 King’s Chapel Burying Ground Boston’s first burying ground. It boasts some illustrious residents including John Winthrop, Massachusetts’ first Governor, and Mary Chilton, the first woman to step off the Mayflower. -6 Benjamin Franklin Statue & Latin School Founded on April 23, 1635, making it the oldest public school in America. Benjamin Franklin was one of the students. -8 Old South Meeting House From 1729, the largest colonial building in Boston, stage for some of the most dramatic events leading up to the American Revolution such as the 30 tons of taxable tea that arrived in 3 ships in 1773 where if unloaded, a tax would have to be paid to England, however people did not have a British representative hence did not wanted to pay. 5000 colonialists congregated here to decide what to do, but no outcome came. At the end, most of the crates were dumped into the sea destroying them. The famous “Boston Tea Party”, that soon led to Independence. -9 Old State House Built in 1713 as the house of the colony’s government. It was here that in 1776, the Declaration of Independence was first read to the people. -10 Site of Boston Massacre In 1768 tensions occurred with the occupation of more than 2000 Redcoats that were sent to quell riots in the wake of the Townsend Duties and to protect customs officials. -11 Faneuil Hall and Quincy Market Two of the oldest markets in Boston, and major tourist attraction especially for the countless food stalls within. Faneuil Hall is referred as “the home of free speech” and the “Cradle of Liberty; the site of America’s first Town Meeting. -12 Paul Revere House Dating from 1680 is the oldest remaining structure in downtown Boston. -13 Old North Church Dating from 1723, the oldest standing church building in Boston. -14 Copp’s Hill Burying Ground Dating from 1659, resting place and cemetery of merchants, artisans and craft people who lived in the North End. -15 Bunker Hill Monument Commemorates the site of the first major battle for the Independence on June 17, 1775. -16 USS Constitution Launched in Boston in 1797, it is the oldest commissioned warship afloat in the world. -Chinatown Between the southeastern corner of the Boston Common and South Station. Not as large as other cities in North America, still good for a walk. -Post Office Square One of the major spaces surrounded with great architecture at the confluence of Milk, Congress and Pearl streets. -Exchange Place Building Designed by WZMH Architects in 1985 marking a great addition into the skyline and perfectly fitting with other historical older structures around it. -Custom House Tower The most recognisable landmark building in Boston’s silhouette. Completed the base in 1847, the tower was added in 1913, in neoclassical style. Nowadays it’s a Marriott full serviced apartment tower, and for 5$ you can access the viewing platform at the top for great views. -One International Place South from the Custom House, was built in 1987 becoming an iconic structure in the skyline ever since with the rounded shape towers. Dowtown – Harborside Home to the wharf’s and piers extremely gentrified into restaurants, bars, markets and luxurious shops among museums and entertainment venues. -Long Wharf Just across from the Quincy Market. Dates from 1721, it is from where most of the public ferries depart, and home to the Chart House Restaurant. -New England Aquarium Located at the next wharf south from Long Wharf. -Rowes Wharf Farther south, notable for the twin buildings joined by a multi-story arch that has become a silhouette landmark. North End Just north across the Quincy Market. The oldest continuously inhabited district in the country since its foundation in 1630. The Freedom Trail passes through it for three of its sights: Paul Revere House, Old North Church and Copp’s Hill Burying Ground. Charlestown The last of the historic districts worth the visit. You will come here as part of the Freedom Trail since the last 2 spots along it terminate here. You can easily reach it walking, or by taking the ferry from long Wharf to USS Constitution. The amount of Federal style rowhouses in here is impressive. Boston is home to one of the largest airports in the country, Logan International. The choice of destinations across the globe is vast, hence quite easy to find a direct flight almost anywhere. Adding to this the ease for getting to any of New York City’s airports, and/or the infinite internal connection flights within the USA, it is by far the main port of arrival to most of the tourists. From the airport you have subway and buses. There is no need for getting a taxi at this point. A free shuttle bus from the terminal buildings, the Massport shuttle, goes to the Airport Metro Station located in the Blue line and from where you can connect to the rest of the network to your final destination. Coming overland from other cities in the USA is very straightforward. Buses are plentiful even in the transcontinental routes (say coast to coast), same as are railways. Along the north east corridor, all the major cities from Boston south to Washington DC are very frequently connected via Amtrak high speed trains (Acela Express) or the Northeast Coast Regional. Within the city, you are never too far from a metro station. The city is greatly communicated with one of the most extensive transit systems outside of New York City and Chicago. Public buses are literally everywhere across the city and beyond the metropolitan area. However as a good side, majority of the city centre is pedestrian friendly with short distances between the sights. It is one of the most walkable great cities you can imagine, and actually of foot is the only way to enjoy every sight of the Freedom Trail, bearing few sites nor far. A single MTBA ticket costs 2.50$, but if you have a Charlie Card then it’s 2.00$ per ride. 12$ for a day pass, and 21.25$ for a 7 day pass. Water shuttles are great for tourists, in order to enjoy the best views of the city and its skyline, at a little fraction of the price that is taking a tourist boat. These go from Long Wharf towards Navy Yard at just 3.00$ per ride. We found Boston as one of the most expensive cities in our trip to get a hotel. This is the fact of now and back in 2012 when we eve had to get one well outside of the centre in order to get something more to our budget. We were counting with a rental car therefore not a problem to be more outside. However, in this occasion the story was different, we needed a nearer hotel as there was not going to be a car involved. The usual applies here, checking some of our preferred affiliate hotel search engine such as Hotels.com, Booking.com, Expedia, Otel.com, Agoda, Opodo, LateRooms or Ebookers. We stayed at the Holiday Inn Express & Suites Boston – Cambridge. While outside of the main core of the city, it is located in between the Downtown and Charlestown districts, right across the Charles River, 250 Monsignor O’Brien Highway, merely 3 mins away from the Lechmere Subway station of the Green Line. A nice property highly recommended to anyone, with very friendly and helpful staff, nicely cared, clean and neat. Comfortable and quiet rooms and a nice breakfast. Back in 2012, we stayed at the Hyatt Place Medford, 116 Riverside Avenue, located in Medford area. Really nice and quiet and not too far from the subway station Wellington, on the Orange Line. A free shuttle is offered to the subway station, but not from it to the hotel back. Many thanks for your visit. Say thanks by sharing it with the world! This entry was posted in 04. North America, 04. September, 05. August, 06. September, 2012, 2018, Big Trips, USA and tagged America, Boston, Massachusetts, North America, Unites States of America, USA. Bookmark the permalink.